Everything in the world has good and bad, pros and cons. As well as any other food, there are some cons for goat milk also. Although goat milk can be super healthy and has many health reasons to drink, such as easy to digest, good for metabolism, high in protein, low in cholesterol, and has plenty of vitamins and minerals, there are several things you should be considered as well. Here’ are 7 disadvantages of drinking goat milk everyday. Goat milk’s taste and smell might not be for everyone. Not only has a sweet taste but it has also a very unusual musky and salty taste that some of you may find it very unpleasing. People called this sensation as ‘goaty’ taste which perhaps can be a popular reason why goat milk is not widely served in a glass to drink daily. It also comes with a very strong smell, which often makes difficult for you to gulp it down. Remember that goat milk also has a high level of lactic acid that can double if the milk is stored above 380 Celcius. Hence, able to affect the flavor and smell of the milk. All of these taste and smell characteristics are actually also depend on how clean the goat is and also its diets. The milk can be sweeter if the goat’s grass is more diverse and healthier and the strong smell can be less if the goat is cleaner. Goat normally produces a lot of pheromones and if it kept close to the bucks, the smell can pass into the milk. Sanitation and how clean is the goat also play role in the milk taste and smell. As long as the goat is cleaned and brushed regularly, the ‘goaty’ taste might be less noticeable. The milk can be sweeter if the goat’s grass is more diverse and healthier and the strong smell can be less if the goat is cleaner. 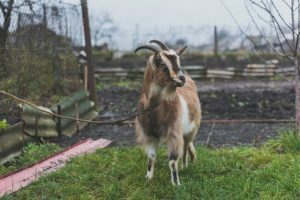 Read here if you want to know more about basic guide of goat farming. Goat milk is naturally low in cholesterol. But compared to other milk variants such as cow‘s milk or plant-based milk like almond milk or soy milk, goat milk has more calories. Hence, before grabbing a goat milk product, make sure you check the calorie labels to find the amount calories in it especially if your concern is on your calories intake and on your waistline. Not only calories, but high fat in goat milk can also be a problem. The fats in goat milk are primarily saturated fat and healthy fat but a cup of goat milk contains almost double amount as cow and goat milk. Again, this may be a concern for you who are watching your fat intake. For addition, goat milk is not recommended to consume in a large portion for those who have a pancreatic disease. The amount of fat content in goat milk can cause pain for those with pancreatic disease and goat milk is also not recommended for those who have thick blood since it can increase hemoglobin. Goat milk is more easily digested by some as it contains less lactose content, smaller proteins, and fat globules compared to those found in cows milk. However, these small amounts of lactose can also have a side effect. Most common goat milk side effects include digestive issues such as gas or bloating. Goat’s milk may also lead you to constipation problem. Therefore, it is not recommended to drink it in too large quantities and for those who have a severe intolerance to lactose. Giving goat milk to the infant may be a little bit tricky. Doctors do not recommend to completely replace breastfeeding with goat’s milk because a higher fat level on goat milk product and it does not have the enzyme lipase, which is needed to break down fats. Therefore, start by combining breast milk and goat milk or adding it to food baby. Goat milk has a good amount of lactic acid but has less folic acid. Folic acid is the synthetic form of vitamin B9 component. It is needed to reduce the risk of neural tube birth defects, prevent cancer, and lower homocysteine level. Goat milk also has fewer vitamin B12 compared to cow milk as well as a little less zinc. Vitamin B12 is involved in red blood cell formation, good for your bone health, prevent the development of age-related macular degeneration, and also a good component for pregnancy health. Zinc, on the other hand, is an essential nutrient that you need to keep your immune system strong and also reduce the risk of age-related diseases. Although it is cheaper to produce, goats only produce about 2 percent of the global milk supply. It is not a product that is mass produced like other dairy beverages, especially milk from the dairy cow. It means goat milk can be more difficult to find in the market so the price might be more expensive than other similar milk product. These 7 disadvantages of drinking goat milk every day are not to conclude that goat milk is completely bad for your health. Goat milk can also have many fantastic benefit and advantage if you take it with the right portion and only as much as you need. Know your own health first may help you to choose whether or not you want to take goat milk as a new option for your daily milk. It is better for you to start with a low amount and increase your portion gradually to assess your tolerance. If you experience any side effects after drinking goat milk, consider decreasing your intake. Above all, your healthy lifestyle including your preference for your daily milk is your choice, so choose wisely!